For as long as I remember I was always dreaming about working on the research and conservation of marine mammals. My journey in the science of biology was full of obstacles but my steps were driven by my passion, hence nothing could stop me from achieving my primary wish. Working on conservation is a great gift and I am grateful to have this opportunity. It is inspiring, to feel that I can make a difference and at the end of the day, it’s immensely rewarding. I started my journey in marine mammal conservation in 2010, when I first jumped in a small inflatable boat and I tried to define, with my colleague, whether and when bottlenose dolphins (Tursiops truncatus) and striped dolphins (Stenella coeruleoalba) were visiting a small gulf of Greece, and if they interacted with artisanal local fisheries. Since then, I had some of the most fascinating moments of my life at sea. My first encounter with the sperm whale (Physeter macrocephalus) is unforgettable. This first sighting occurred in Gibraltar when I was working for CIRCE (Conservation, Information and Research on Cetaceans). It was a sighting of a large male sperm whale surrounded by a meddlesome pod of long-finned pilot whales (Globicephala melas). The large animal dove out of our sight soon, following a pattern of peculiar behaviour by exposing his teeth and his open mouth before starting his dive (Figure 1), a behaviour, which may have been induced by the harassment from the pod of long-finned pilot whales. Figure 1. 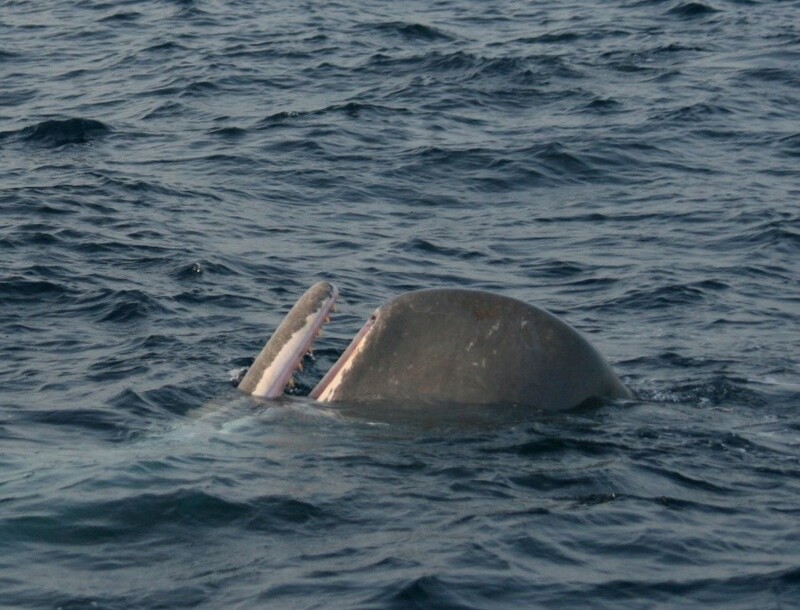 A male sperm whale in the Strait of Gibraltar is exposing his teeth. A peculiar behaviour, which may have been induced by his harassment from a Long-finned pilot whales’ pod. I travelled around the Mediteranean Sea in the following years to participate in several projects in Greece, Italy, Spain, Turkey, and Cyprus. Since whales and dolphins are considered as highly mobile species and the same animals can be found in two countries in the same week, my life became a seaman’s life. During my work at the Pelagos Cetacean Research Institute in Greece, I had the opportunity to work further on sperm whales and my scientific interest was mainly focused on these fascinating giants. I moved to Ireland to follow my dream further and collaborate with top scientists of marine mammals like Simon Berrow and Joanne O’ Brien. We are developing a study aiming to determine the habitats of deep diving cetaceans in Irish offshore waters, by using acoustic data. Moreover a secondary objective of the project is to estimate the severity of the impacts that human activities could have on critical regions for the marine mammals. The study will focus on two species of the Irish Exclusive Economic Zone (EEZ); the pilot whales and sperm whales. Sperm whales and long-finned pilot whales are considered as deep divers, they live in offshore habitats showing preference for areas with complex topography. In Ireland their preferred region lies in the deep waters (500m+) beyond the Irish Shelf edge. The highest relative abundances have been recorded by scientists in the Rockall Trough, particularly along the lower continental shelf slopes and the lower slopes of the Porcupine Bank. Moreover sperm whales are assessed as the most abundant deep water whale species in Irish waters. The researchers have found the species mainly in the Rockall Trough. All the sightings were recorded in water depths greater than 500m and the majority of them in waters deeper than 1000m. Both species are rather talkative. 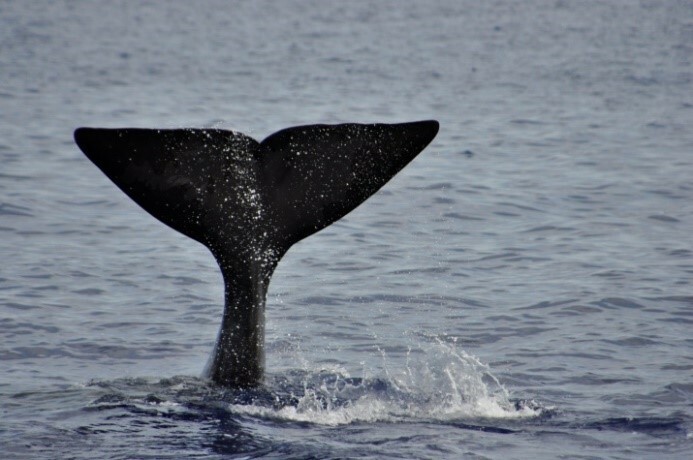 They produce different forms of acoustic signals, such as echolocation clicks, codas (sperm whales) and whistles (long-finned pilot whales) to locate their prey, communicate and avoid predators (Figure 2). These vocalizations could indicate feeding habitats, seasonal trends of the populations and critical areas where their presence is recorded regularly. An estimation of the preferable habitats can be used for planning protected areas, investigating population trends, assessing animal abundance or evaluating the impact of human activities. In recent years an increase in research using acoustic recorders to detect the animals raised the available information and constituted a cost efficient method to collect long term data of presence and absence, habitat use, seasonal variations and diel patterns for the species by using static devices. Figure 2. 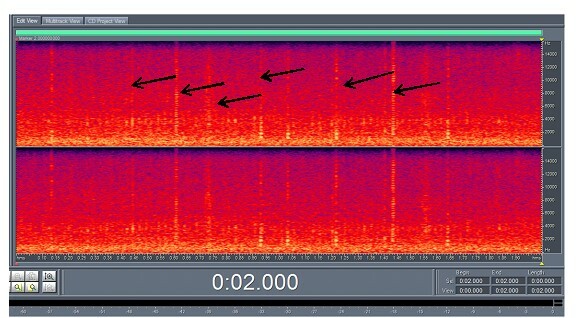 A spectrogram, which shows the clicks of a sperm whale. These are vocalizations that are used by the animals for echolocation in order to detect their prey and navigate in deep waters. Human activities in the sea may produce sound with variable energy ranges that raises significantly the levels of noise in the marine environment, and this has a potentially versatile effect on the marine organisations. Marine mammals in particular are considered to be highly sensitive to man-made noise. They depend on sound for their primary needs. Scientists suggest that they use sound in order to communicate, locate prey, avoid predators and sense their environment. They show sensitivity to sounds with frequency ranges similar to the ones they produce themselves. Noise became an issue when it emerged in 1990 during the ATOC project, which firstly dealt with anthropogenic noise in the ocean. Several studies and reviews have since been conducted to estimate anthropogenic noise and the impact to cetacean and other marine species and there is a rising interest from the scientific community and regulatory agencies on the subject. The importance of relevant research in recent years must lead to a more effective management of offshore waters, which should ideally involve all the stakeholders. The environmental impact assessment of noise activities should possibly follow an integrated model to estimate and address the risks. It should ideally take into consideration the changes in population level and other ecological factors such as the preference of specific habitats; feeding, breeding and mating regions for the marine mammals. Hopefully this project will add further information regarding the presence of two species of deep diving cetaceans in offshore regions of Ireland and will effectively support any conservation strategies for them in the future.